During the last weeks, we have been busy working on integration of the appstream project into openSUSE tools. Appstream is a cross-desktop initiative that provides APIs and concepts for building a Linux App-Store. We are extending the Ubuntu Software Center to be useable for other Linux distributions, working on Apper to support the additional metadata and enhance our software page with appstream data. The next step will be the creation of an App-Store containing the applications of the latest release with browsing by category, ratings and comments. A preview of the app browser is already available here. Please tell us what you think about the new package search and the overall appstream project! Join us on #opensuse-project on freenode, or on opensuse-project@opensuse.org. Dropbox is an absolutely great tool to share your data between different computers and mobile devices. Your data is stored in the cloud from where you can publish files and photo albums and work collaboratively on documents. It works very smoothly, has a great performance, and provides client apps for Linux, Windows, Mac, iOs, Android etc., offering 2GB space for free. That sounds perfect, where’s the catch? You are giving your private data to a U.S. based commercial company, which recently had a credibility issue, some security problems, awkward terms of service changes, and the fact that the government can get access to your data. This is where ownCloud might be your choice. It is an open source webdav server that can be deployed on your own webspace. It does not yet have all the features and smoothness of Dropbox but it’s catching up. The recently released version 3 comes with file-sharing, contacts and calendar syncing, and an online music player. The package wdfs is included in the openSUSE standard repositories. wdfs can be used as normal user, no root privileges and changing of /etc/fstab is needed. After you have mounted your ownCloud to the system it can be used just like a local filesystem. Berlin is a great location for the Linuxtag, it’s always nice to come there. Just have a look at the photo: The boosters are getting hip! Nearly the complete boosters team was there to meet, be available at our booth for questions and take part at the talks. With over 10.000 attendees it’s the biggest event of this kind, and you can be sure to always meet some well known faces of the openSUSE community there. On the technical side, there were some interesting talks about virtualization, cross-distribution, kernel and the usage of free software in business environments just to give a few examples. Google’s summer of code 2011 is approaching, and openSUSE.org got accepted as mentoring organization. There are even some days left to propose a new project to hack on! In that case we would try to find a suitable mentor from our community to get you started. There are quite some interesting project proposals on our gsoc2011 wiki page, reaching from build service projects to SUSE Studio tools and distribution specific tools, as well as cross-distribution efforts. I would like to mentor a student in the OBS Mobile project which will create a nice interface to use the buildservice from your handheld. So if you are skilled in web technologies (jquery-mobile, rails) please apply and get the chance to hack this summer of code on this exciting project! To get in contact with the openSUSE community please join channel #opensuse-project on freenode, or our project mailinglist at opensuse-project@opensuse.org and we will help you to get started. After 8 months of work openSUSE 11.4 has been released last week! This has been celebrated with release parties all around the world. LibreOffice, Gnome and KDE packages. 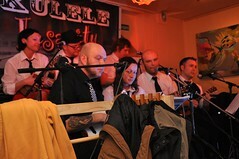 In Nuremberg, we celebrated the release with a party at the Artefakt bar, and had the fabulous Ukulele Insanity playing live. NetworkManager: (wlan0): deactivating device (reason: 2). I am using a crypted home partition since a long time, and this was configured in /etc/cryptotab and enabled during boot in /etc/init.d/boot.crypto until the upgrade. My project for Hackweek IV was to bring openFATE to mobile devices, and have a shared framework, so we can easily create mobile versions of other opensuse sites, for example the build service. I decided to use the jquery mobile framework and together with Andre we created a rails plugin that automatically switches iPhones and android devices to the mobile version. which offers some basic functionality, such as request handling, showing build status etc. After creating your app you can publish it in the Android Market and make it available to millions of users on their smartphones. The SDK package can be installed from the build service or by manually downloading and unpacking the file from google. write to, as it makes the installation of different android platforms (eg. 1,6, 2.2 …) easier. The ADT plugin is currently available for eclipse 3.5 („Galileo“) which can be directly downloaded here. The ADT plugin can easily be installed using eclipse’s internal plugin manager. The ADT plugin adds a little Android icon to the toolbar which opens the AVD manager. This tool allows you to install several Android platform versions and and to start a virtual Android device. This virtual device can be used to test and debug your app. The Android developer page contains a nice Hello World application to get you started. I would like to show an app that Duncan Mac-Vicar started: The openSUSE Build Service App. Hosted on gitorious.org it’s easy for everyone to get the sources and play around with it. I just committed a quick fix to it so that it sorts the projectlist alphabetically. infrastructure to build and distribute them? There will be a talk at the openSUSE conference „Collaboration across Borders“ that will take place in Nuremberg, Germany from 20th to 23rd of October 2010. I did a talk about Ruby on Rails in the openSUSE.org infrastructure (german) (slides) which showed how we use rails and which experiences we have with rails and related tools in the openSUSE.org infrastructure. On our booth we released the Build Service 2.0 last friday, and did a workshop helping people to install their own buildservice instance. I prepared an appliance in SUSE Studio for that, that reduces the effort of running your own buildservice instance to booting a live cd or a vmware image. On our booth and all around the hall the openSUSE balloon clown was in action and created nice geekos for the audience! Welcome to my blog! I am an openSUSE hacker and I'm blogging here mainly about Linux and Web related stuff. Please contact me if you have any questions.